In the previous articles, we looked at the overall structure of the gameplay for Castle Crashers and that of the previous three starting characters – the red knight, the blue knight, and the green knight. This article will focus on the last starting character, that of Castle Crashers Orange Knight. In case you missed the previous articles, Castle Crashers is a side scroller console game for both the XBox 360 Arcade system and that of the PlayStation online Network system. The game is available for download on both console's online networks and can be played with up to four players. The general gameplay takes some elements from classic RPGs, in which players start out as either one of the four knights mentioned – red, blue, green, or orange – as they try to stop the Evil Wizard and his minions, who have not only stolen a magic crystal but have taken prisoner four of the surrounding kindom's princesses. Each knight has a separate ability tied into a magic power, allowing them to defeat their foes and get the girl. As previously mentioned, when a player begins Castle Crashers, they can choose from their choice of one of the four knights. 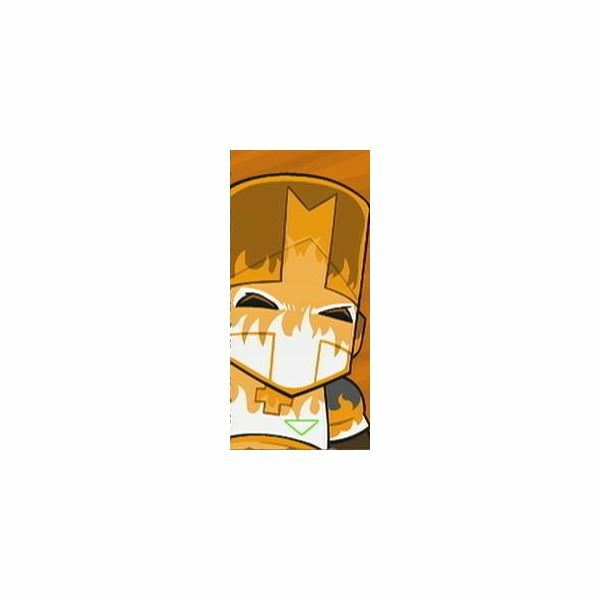 Castle Crashers orange knight has a magic base that is based on fire and there fore, all of his powers are primarily fire driven. His standard or splash attack is that of the flame burst, which is – as it sounds – a burst of flame that can be directed at any enemy or opponent and does damage when hit. opponent that is selected. He also has an magic jump, known as the fireball. In this, when the orange knight jumps over his opponents, a fireball ignites, attacking any enemy that was in his area. As far as use with the other knights, the orange knight probably has the longest range in his flame burst, which has a slightly longer radius than that of his counterparts. As with his fellow knights, Castle Crashers orange knight is able to unlock at least two characters if a player finishes the entire game playing this character. The first unlocked character is that of the Fire Demon, which is first encountered by the knights in the fortress of the Cyclops. Like the orange knight, the Fire Demon's powers are fire based and his starting weapon is that of the black morning star. If a player then beats the game a second time, by playing the Fire Demon all the way through, that character will unlock the Ninja Pirate. The Ninja Pirate – also known as Ninjer – is first encountered aboard the pirate ship, hence why they are pirates. Ninjer's skills are based on his being a ninja, so expect a lot of ninja smoke, spinning stars, and ninja jumps. His starting weapon is that of a sai. A guide to Castle Crashers.